As mankind has entered the 21st century, the natural ecological and social environment on Earth has undergone major changes, people's ideas of their own health have also been constantly updated, which makes modern medicine facing more challenges. Infertility—for those who yearn for a child—may be the source of prolonged pain and suffering. Treatment which offers help to the infertile is therefore one of the highest forms of medicine. Both in modern biomedicine and in traditional Chinese medicine, however, the focus has mostly been on the female partner. There is partial justification for this since a healthily fertile woman can compensate to some degree for impaired fertility in the male. Yet often the failure to address the male component of couple infertility reveals a deeper pattern of marginalising male health—a problem almost entirely created of course by men themselves. This failure is especially significant in a world where male fertility is declining in most animal species, including humans. As we know from Chinese philosophy, we need to cultivate both yin and yang, and there is ample evidence that male infertility or subfertility is a factor in up to half of all couple infertility. And there are several benefits to be found in addressing the male partner. Firstly, underlying diseases and patterns of disharmony (as recognized in Chinese medicine) may be discovered and treated, benefiting a man's broader health and wellbeing. Secondly, successful treatment of male infertility may reduce the onus on the female to take fertility enhancing medication which may cause unwanted side effects. And finally, of course, the chances of a successful pregnancy will be increased if the male partner is treated as well as the female. The treatment of female infertility has been the greatest success story in China's integration of cutting edge biomedicine with its long and rich medical traditions. This combined medicine now stands as probably the world's most successful and powerful approach to achieving successful pregnancies. What has been missing, however, is an equivalent approach to treating male factor infertility, and practitioners have been unable to find a comprehensive and integrated account for both Western and Chinese medical approaches. 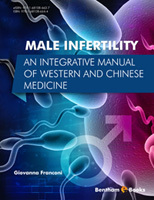 Missing until now, that is, with the publication of Giovanna Franconi's welcome Male Infertility: An Integrative Manual of Western Medicine and Chinese Medicine. This is the kind of book that should make the Western Chinese medicine profession proud, offering as it does a clear and comprehensive manual for the enhancement of fertility, which is the vital source of life. Infertility is a problem that adversely affects the quality of life for a growing number of couples. Clinically defined as the inability of a sexually active couple to achieve pregnancy spontaneously within a year, it affects about one couple in every five. The advent of IntraCytoplasmic Sperm Injection (ICSI) has revolutionized infertility treatment, in particular for the male factor. Nevertheless, it continues to be important to properly assess infertile men to identify any infertility conditions that can be potentially corrected, in order to avoid the use of procedures of Assisted Reproduction Techniques (ART) whenever possible. On the other hand, even if some conditions of irreversible infertility can be treated with ART, it is important to identify those cases where this is not possible, saving the biological and psychological cost of ineffective therapies to the couple. The objective of the evaluation of the infertile male should also include, in addition to sperm recovery, the optimization of the reproductive potential in order to use less invasive reproductive techniques. It is also important to identify certain specific genetic causes of male infertility, which allows the couple to be informed about the possibility of transmitting genetic abnormalities to their offspring. Finally, we must not forget that the infertile man is not a healthy man. The altered spermatogenesis, on the basis of epidemiological data, is correlated with an increased risk of testicular cancer—the most common cancer in the age group between 15 and 44 years—the incidence of which is increasing in Caucasian populations. In recent decades more emphasis has been placed on the role of the male factor in couple infertility, but it is still not adequate. Despite the fact that the male factor alone is responsible for infertility in 20% of couples, and that together with the female factor it contributes to infertility in another 30–40% of cases, it often happens that infertile couples are evaluated only by a gynecologist, who may have not received specialized training regarding the male factor challenges. Male infertility is idiopathic in 50–70% of cases, and therefore subject to a mostly empirical therapy with limited effectiveness. This therapeutic gap could benefit from other medical approaches which deal with health and disease using different approaches. Traditional Chinese Medicine (TCM) is one of the few comprehensive traditional medical systems in use in the world, and with its age-old traditions and its sophisticated diagnostic and treatment system it can make a great contribution to human health. Over the course of thousands of years, TCM has developed a complex conceptual and methodological framework to both diagnose and also treat male infertility. The problems related to infertility appear in the oldest texts of Chinese medicine, and a growing number of scientific publications are evaluating its efficacy in the field of infertility. TCM considers health and disease from a holistic point of view, based on the concept that the body is able to self-regulate and adapt to the environment. For these reasons, in many ART centres around the world the gynecologist and the andrologist are complemented by an acupuncturist to maximize the fertility potential of couples, effectively creating an integrated approach to infertility. The Western medical system at this time is a system based on evidence, applying therapies that have been found effective in randomized controlled studies, in which it is demonstrated that an intervention with a particular drug induces a greater therapeutic response than a placebo. The traditional Chinese medical system, however, is a system based on experience: the transfer of empirical knowledge from teacher to student over generations for centuries suggests the safety and efficacy of treatments handed down by tradition. This book originates from the fact that the integration of Western medicine and Chinese medicine is asked for and sought after by infertile couples, and it has been written to help treat an infertile man by a specialist in acupuncture and/or in Chinese medicine, but who has no specific specializations in andrology. It is a manual that can serve as a guide in the clinical evaluation of the infertile man, both from the etiopathogenic point of view to understand the causes of his infertility, and from the diagnostic point of view to evaluate and interpret the biochemical and instrumental tests, and from the therapeutic point of view to develop a rational and integrated treatment. The numerous and detailed Appendices and the extensive Bibliography provide direct access to the most important technical information of Western medicine and Chinese medicine, providing an information platform for orientation and treatment of male infertility. This is not a self-treatment book, and the treatments should be recommended only by specialists in Traditional Chinese Medicine. The Chinese herbal formulas mentioned in the text are indicative, and it is the task of the doctor of TCM to carefully evaluate indications, contraindications and incompatibility of individual herbs and formulas in each case. Also, local legislations which may have introduced restrictions on the use of various remedies of the Chinese pharmacopoeia should be checked. Quotations from the Su Wen are from the book by Paul Unschuld , and those from Lingshu are taken from Van Nghi’s book . While the publisher and the author have used their best efforts in preparing this book, they make no representations or warranties with respect to the accuracy or completeness of the contents of this book and specifically disclaim any implied warranties of merchantability or fitness for a particular purpose. No warranty may be created or extended by sales representatives or written sales materials. The advice and strategies contained herein may not be suitable for your situation. You should consult with a professional where appropriate. Neither the publisher nor the author shall be liable for any loss of profit or any other commercial damages, including but not limited to special, incidental, consequential, or other damages. This manual is based on the direct and indirect contribution of many, whom I thank here following a purely alphabetical order: Rosa Brotzu, Dante De Berardinis, Carlo Di Stanislao, Jlenia Elia, Andrea Fabbri, Giovanni Giambalvo Dal Ben, Mario Goncalves, Henry Johannes Greten, Paola Innocenzi, Csilla Krausz, Li Hong, Mario Maggi, Luigi Manni, Ferdinand Mazzilli, Samuele Paparo Barbaro, Antonio Parisi, Salvatore Raffa, Nikki Wyrd. Special thanks to Francesca Zito for her impeccable work of transcription. Without the encouragement and assistance of Cafiero Franconi and the constant support of Anna Maria Del Signore and Ernesto Rossi this book would never have seen the light: they deserve a thank you from the bottom of my heart. Cardini F et al. Clinical research in traditional medicine: priorities and methods. Complem Ther Med 2006; 14(4): 282–7. Unschuld PU, Tessenow H. Huang Di Nei Jing Su Wen An Annotated Translation of Huang Di’s Inner Classic—Basic Questions University of California Press 2011. Van Nghi N. Huangdi Neijing Lingshu Books 1–3 with commentary Sugar Grove, NCJung Tao Productions 2005.